SIMPLE GREEN Review and GIVEAWAY!!!! These guys were Green, before "Green" was a term I think. I can remember my Mom using the dark green spray back when I was little. I have used it in my home since I've been out on my own. I haven't tried their Naturals Line. When I got the chance to work with Simple Green on this newer product family, I was really looking forward to it. It's one of those companies I already trust and use, so trying new stuff is like a fun, new twist on a dear old friend. I got to try the Dish Washing Liquid, Liquid Hand Soap, Multi-Surface Care, Bathroom Cleaner, Glass & Surface Care, & Carpet Care. I love them all. All the products in the naturals line are made from 100% naturally derived ingredients, are non-toxic, biodegradable & never tested on animals. 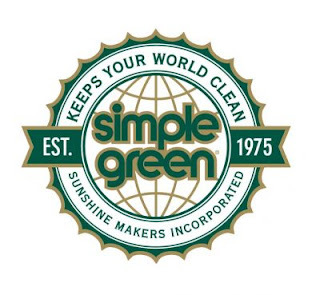 And congrats to Simple Green for recently receiving the GREEN SEAL certification!! What does Green Seal Certification mean? - Green Seal identifies products that are designed and manufactured in an environmentally responsible manner; offers scientific analyses to help consumers make educated purchasing decisions regarding environmental impacts; ensures consumers that any product bearing the Green Seal Certification Mark has earned the right to use it; and encourages manufacturers to develop new products that are significantly less damaging to the environment than their predecessors. This means that Simple Green Naturals really are what they say they are - simple & green. You will notice when you use these products that you feel good just using them. They work really well, they have a natural - no perfumed scent, and they are clear, with no unnecessary added colors. When my children use the hand wash, I know that there are no un-pronounceable going into their bloodstream and that makes me happy. If we would all start using vegetable based cleansers like Simple Green, can you imagine the difference we could make?! Did you know if every household in the U.S. replaced just one bottle of 28-ounce petroleum-based dishwashing liquid with a vegetable-based product, we could save 82,000 barrels of oil a year? This is enough oil to drive a car over 86 million miles! That's just one bottle!! I am a forever friend of Simple Green and I hope you will be too ! *Visit Simple Green, and tell me something that is important to you about their company or products. MomMostTraveled.com is a family travel blog with great giveaways and product reviews! Their products are not only great for the environment, but they are safe, too! They even make sure that they are non-flammable! I appreciate that! I like that they never test on animals, and are biodegradable. I like that the original founder was going green WAY before it was the responsible thing to do. He was a leader! I like that Simple Green's products have natural scents that are made with 100% natural essentials oils and plants extracts and that they don't test on animals. Thanks so much for such a wonderful and generous giveaway! I just love Simple Green Products,They have such a great assortment. One thing that is important to me and that I like is, in the words of the company: "Simple Green Naturals are 100% naturally derived, with ingredients originating from nature: chicory, coconut, corn, palm, naturally occurring minerals, salt and sugar, and water. Nothing else." I like that their products are not tested on animals..my three dogs thank Simple Green. I love that their products are 100% natural. I like they have natural scents. I love that they dont use animal testing. Important to me that they have non-toxic formulations. With a baby in the house now, I'm super sensitive about using non-toxic products - these are great! That their products are 100% natural ingredient sources & Biodegradable formulations. I love that this company uses Non-toxic formulations and No animal testing. hooray for biodegradable and no animal testing! I like that their products are not tested on animals. That's important to me. I love that they "donate over 1M gallons of Simple Green® products each year" That is awesome! I like that their products are biodegradable and comes in recyclable packaging. I love that Simple Green has been producing environmentally friendly cleaning products that are non-toxic and biodegradable for over 30 yrs!